Shutdown leverage: Forget Obamacare. Republicans are using the shutdown as a weapon in the debt ceiling fight. Republicans say they’ll extend the shutdown as a weapon in the debt ceiling fight. House Speaker John Boehner at the White House on Oct. 2, 2013, the second day of the government shutdown. Three days into the federal shutdown, Republicans are beginning to admit that, contrary to everything they told us, they didn’t really close the government to stop Obamacare. They did it, and will keep doing it, to gain leverage in the coming fight over the debt ceiling. The government will stay shut for the next two weeks so that the GOP can accumulate power. House GOP leaders and most of their rank and file never supported conservatives’ efforts to use the budget bill and the threat of a government shutdown to defund Obamacare … But having gone as far as they have, House Republicans now say they won’t back down. And they expect to score political points in the process. kept sending the Senate bills that would completely defund or delay the health-care law, knowing it would lead to a shutdown. … Now that Boehner has survived several days of the shutdown, his friends say there is no point in moving a clean funding resolution. They said the shutdown is leverage in talks with Obama and the Democrats about lifting the debt ceiling. Republicans, including those same conservatives, attempted to shift the conversation away from defunding ObamaCare to larger items such as entitlement spending and tax reform. … Stutzman added that those same conservatives essentially stopped talking as much about ObamaCare and have moved on to broader economic matters. I didn’t come here to shut down the government. I came here to fight for a smaller, less costly, and more accountable federal government. But here we find ourselves in this moment dealing with a law that’s causing unknown consequences and unknown damage to the American people and to our economy. And that issue is Obamacare. … This is not about me, and it’s not about Republicans here in Congress. It’s about fairness for the American people. There’s no way to square that statement with the latest disclosures. 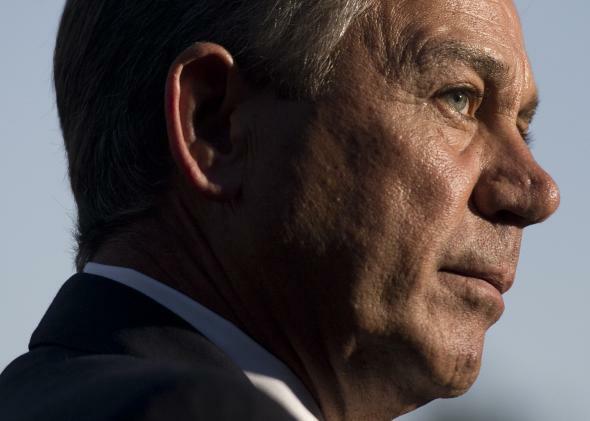 Boehner never believed in trading the shutdown threat for Obamacare. He knew what he’d get was a shutdown. Second, contrary to what he told us, it’s all about Republicans in Congress. By their own paraphrased admissions, it’s “about strengthening their hand in the debt-ceiling talks.” It’s “leverage” in the debt ceiling fight. They knew that the deadline for that fight was Oct. 17. Yet they choked off government funding on Tuesday, under the pretense of stopping Obamacare. Today is Oct. 3. Republicans are prepared to keep the government closed for at least two more weeks, just to gain the upper hand in a future confrontation. Remember when these guys captured the House? They said they weren’t coming here to play the Washington game. What an excellent joke.